These days, it is unlikely that anyone interested in superheroes would be unfamiliar with the Marvel character T’Challa, also known as the Black Panther. He was introduced to the movie-going public in the latest Marvel blockbuster, Captain America: Civil War (2016). His latest comic book series, which debuted in April 2016 to much acclaim, is being written by none other than Ta-Nehesi Coates, one of the contemporary USA’s most trenchant writers on race (or, as one reviewer of his most recent book points out, the USA itself) and the recipient of a 2015 MacArthur Genius Grant. Coates wants to make his mark on the character, in part by making his first arc ‘a post-colonial, post-modern, deconstructionist look at militarism, imperialism and heteronormativity’ and in part by incorporating an African American literary and cultural tradition into his work. With this goal, Coates is poised to move Black Panther farther away from where he started out than any writer to date. First introduced in the fifty-second issue of Fantastic Four back in 1966, T’Challa is the leader of the Wakandas, an African people that inhabits Marvel’s fictional universe. Over the years, he has been many things. He has been a king, a member of Marvel’s flagship Avengers superhero team, and an urban vigilante, walking the publisher’s uncommonly gritty version of New York City’s Hell’s Kitchen neighborhood. He has fought racism in the USA and Apartheid abroad, and otherwise been enlisted for progressive purposes, if sometimes with mixed results. Much has been written about Black Panther in recent years. Marvel, for example, published a series of articles about the character in time for the company’s 75th anniversary. Although for obvious reasons very positive about Marvel’s record, and leaving little room for the character’s first appearance, it is nonetheless worth reading. Similarly, several academic and journalistic books and articles mention Black Panther’s first appearance in passing, often claiming him as a revolutionary figure – both in what his appearance meant in terms of black representation in popular culture and in his own politics as a character – and as inspired by the Black Panther Party. Then, invariably, the writer moves on to deal with some later aspect of the character. As Marvel’s first black superhero, Black Panther was definitely something new. But placing him within the orbit of African national liberation movements or the radical Black Power politics emerging in the US of his day has always seemed like a step too far to me. (Notably, in a move to disassociate the character with the Party, Black Panther was briefly renamed “Black Leopard” in the early 1970s.) Not because I don’t want Black Panther to be a figure of change, but because it is so unlikely that he was, given where he was born, and by whom. Black Panther was created by Stan Lee and Jack Kirby, the creative duo that together helped launch what has become known as the “Marvel Age” of American superhero comics. They created the Fantastic Four, Ant-Man, the Hulk, Thor, Iron Man, the Avengers, and the X-Men. But Lee and Kirby’s creative legacy, which is today both part of Marvel’s massive movie universe and of a controversy about who created what, also has a dark side. The heroes were almost all born as Cold Warriors. Their world was near-exclusively a domain for white, middle class men. Even the X-Men, a series since often hailed as an allegory for tolerance (much thanks for writer Chris Claremont’s 1975–1991 tenure), was then part of a backlash against radical civil rights activism. This is the world Black Panther was born into. In “‘Introducing the Sensational Black Panther!’ Fantastic Four #52–53, the Cold War, and Marvel’s Imagined Africa,” my recent article for The Comics Grid: Journal of Comics Scholarship, I try to situate Black Panther within this context. In it, I read Black Panther as an example of “white on black representation,” white images of blacks centered on white interests, filtered through Marvel’s then-prevalent Cold War focus. What I find is that the original Black Panther appears to have been a sort of response to US fears about what the then-recent decolonization of large parts of Africa might mean for the USA; in the triangle that is set up between the Fantastic Four, the Black Panther, and the supervillain Klaw, Black Panther is made to side with the US superheroes against the veiled communist threat represented by the villain. This happens through a process of “Americanization,” whereby Black Panther hails consumerism and champions a US Cold War discourse of “helping humanity” that Lee and Kirby had often used in other work. At the same time, the comics reproduce a colonial “Imagined Africa,” a backwards and dangerous place where history can only be made once whites have come along. What I hope this article will do, aside from arguing for more attention to representations of spaces outside of the USA in Marvel’s 1960s Cold War politics, is to help establish a baseline from which Black Panther can be studied and discussed in the future. 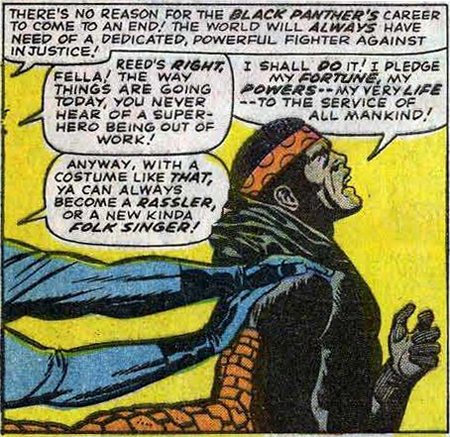 Such a baseline is important even today, because Black Panther, while he has undoubtedly come a long way since his first appearance, still often becomes the focus for debates about how black characters are represented (or not). Marvel Comics has a long and often problematic history with minority representation, as do US superhero comics overall. Black Panther is part of that history. Just because change seems to be on the wind at Marvel these days, particularly with Coates’ stated intentions for his Black Panther, it doesn’t mean that we should forget just how much has changed, or how long Black Panther has had to travel to get to where he is today.